Bridal Shower Wishes : Marriage is a journey that a girl begins with a broad smile on her face. Inspire her and wish her well for her married life by sending bridal shower messages that we have listed below. We have listed bridal shower messages that can be sent by a friend, parents, sibling, colleague or well wisher. 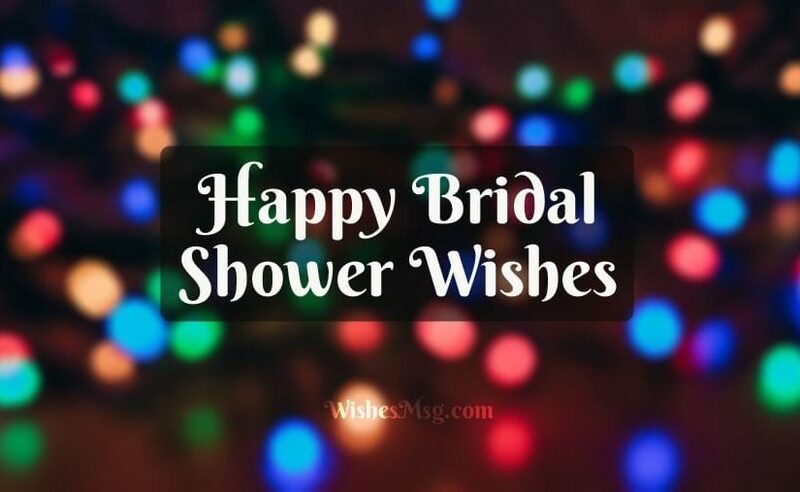 We have list bridal shower messages that are funny and the bride will have a good laugh reading them when anyone close sends it to her. You can send inspirational and religious messages to motivate the bride confidence and send your blessings to start her married life happily! I wish all the blessings to be bestowed upon you from the Lord and his angel’s so that your marriage is a successful one. Congratulations for your bridal shower! Never let go each other hands. Stay together to face all the hurdles of life happily. Wishing you my best wishes, have a happy married life! Congratulations! Begin your married life with a broad smile on your face, you will surely be happy with your life partner forever. 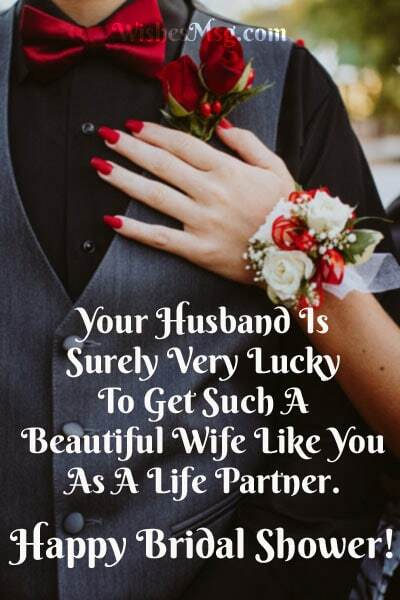 Your husband is surely very lucky to get such a beautiful wife like you as a life partner. Happy bridal shower! You are glowing with the happiness of being together with your life partner. Keep that glow in your face forever. Keep glowing, dear! Celebrate togetherness every day since the day one of your marriage. That is how you two will be the happiest. Congratulations! I have seen immense love in his eyes for you. I am happy that you guys are tying the knot of love! Congratulations! Stay happy always. You both look beautiful together, and I pray for you guys to stay with each other lifelong facing all hurdles of life happily. Congratulations for your bridal shower! The Lord paired you both together to become one. Always keep your partner happy. May you both stay blessed during your entire married life! The Almighty surely loves you a lot, as he paired you up with someone so honest and modest. Wishing you all the best, have a blessed married life! 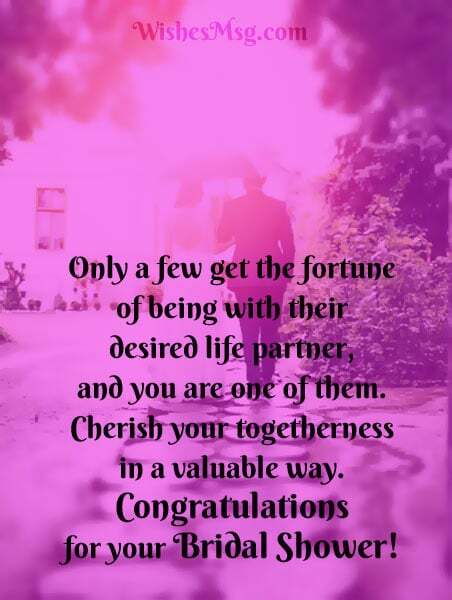 Only a few get the fortune of being with their desired life partner, and you are one of them. Cherish your togetherness in a valuable way. Congratulations for your bridal shower! Like you love your life partner and value him, value his loved ones also. This will make the bond between you guys even stronger. Stay blessed and happy together, always! Love your life partner but also do not forget to thank the Almighty for your togetherness. Congratulations on your togetherness! Be the reason for your life partner’s support, confidence and happiness along with being his wife. Best wishes to you both for a beautiful marriage filled with joy! Always keep valuing the bond of love that you share with him along with being together! Congratulations! Keep holding onto the bond tightly! May the Almighty safeguard your smiles from evil eyes of rest of the world. Congratulations to you both! Don’t eat up the head of your husband with your craziness. May Almighty give him the strength to bear your craziness! 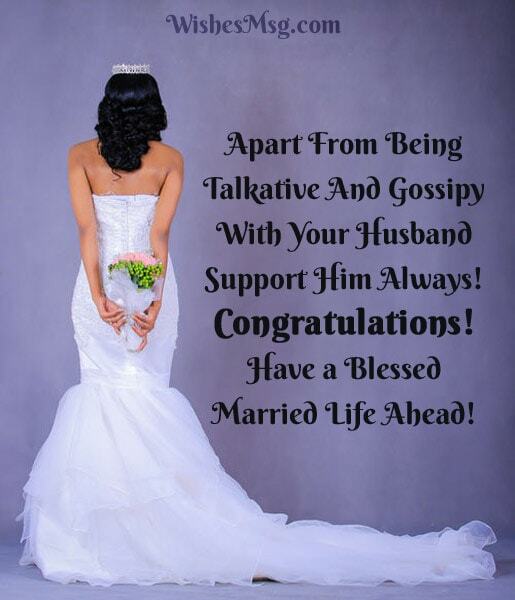 Apart from being talkative and gossipy with your husband support him always! Congratulations! Have a blessed married life ahead! Control your shopping expenses after you get married! Don’t make him starve by wasting all his money! I wish for you to gain wisdom to save your husband’s money! Improve your cooking skills quick otherwise your husband will die out of hunger! Happy bridal shower! Along with demanding love from your husband, don’t forget to love him back. Stay blessed and happy together! Finally you guys are together! I have seen how many hard situations you guys had to face! But don’t take each other for granted after getting married. Congratulations for your bridal shower! I will definitely say your husband to be careful of your madness! I am giving my best wishes for your happy married life! Do not make your husband do all the chores! I will also warn him beforehand about your laziness! Congratulations for your bridal shower, bestie! Seeing you all grown up and ready for marriage make me emotional yet immensely happy. Congratulations Princess for your bridal shower! I am getting hurt by seeing my daughter go away from me but parents of the whole world wait for the day to see their daughter get married. Have an amazing life ahead. You have chosen the right partner for yourself! We are relieved that by seeing you will be the safest with him! Stay blessed, my child! Along with being love in a married life, there will be a lot of ups and downs that you will have to face in your marriage. Face them by being strong and don’t let go each other’s hands. Congratulations for your bridal shower, Princess! Like you have made us the proudest by being the best daughter, make your husband the proudest by being the best wife! 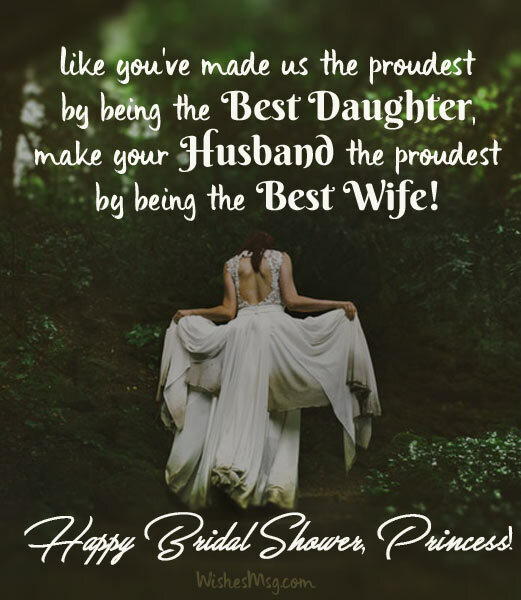 Have a blessed bridal shower, Princess! Always be the shadow of your husband and keep supporting during his hard times. Congratulations my daughter! Have a blessed married life! You have my best wishes and blessings for having an amazing married life ahead. Start the journey of love with a broad smile on your face! Congratulations my child, enjoy your bridal shower! Love your mother and father in laws like you love us. They will be your second parents and they will look after you forever. You will always have my blessings, love and support! To conclude, all the brides eagerly wait for being blessed and wished on their bridal shower. The messages listed above are the most perfect ones to send. In addition, when you post pictures on social media with the bride and you are thinking of caption, without any worries you may use the messages listed above. She will be definitely overwhelmed!